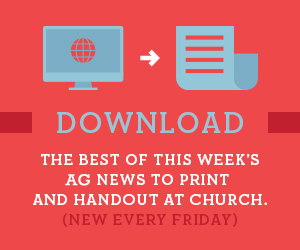 Download this week's top stories from PE News to print and distribute at your church. This download is formatted for printing two 8.5" x 11" sheets of paper in landscape orientation, folded in half. Download the printable PDF at the link above or here. For the best print quality, we recommend opening the PDF in Adobe Acrobat Reader. If you don't have it installed, you can download it free here . In the Print dialogue box, select "Fit to Page" to ensure that your document will print within your printer's margins. Print the document "Double-Sided" (select fold on short end, if prompted) on two sheets of 8.5" x 11" paper in landscape orientation. Fold the printed document in half to form an eight page booklet.